Coexisting With Nonhuman Animals: SAFE's $2Million war on "factory farming"
Factory-farmed pigs and chickens will soon have a powerful and wealthy ally in the form of a mystery multi-millionaire who is joining forces with SAFE in an effort to prevent widespread animal suffering on factory farms. Sunday will reveal SAFE now has a $2 million fund with its main purpose of freeing pigs and battery hens from cruelty. It’s a new offensive in the war against sow crates and battery farming and the millionaire has pledged to spend until the job is done. SAFE director Hans Kriek says that the Sunday programme will announce an exciting new initiative that will be considered by pig, chicken and battery hen farmers as the single biggest threat that they have ever faced. View online after 9pm, Sunday. Have your say on the Sunday's message board. Vote with your heart and wallet! Don't buy factory-farmed pork. Take the pledge against pig cruelty. Click here to join SAFE's facebook page. Author Anna Sewell once wrote: "If we see cruelty or wrong that we have the power to stop, and do nothing, we make ourselves sharers in the guilt.""" I'll be VERY interested to find out more, who the "mysterious millionaire" is (comedian Mike King from past "welfare exposés? "), and what footage of screaming pigs/chickens in cages will be used. Continuing this Welfare Reform will ultimately will do NOTHING to help animals, I, like many other New Zealand Vegans wish SAFE would simply promote *veganism*! 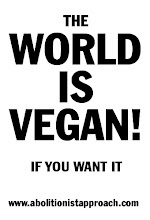 Think of how well all the Vegan advocates in the world are spreading the message, through creative, and nonviolent education, of recognising we are *all* the "exploiters" of animals, not just some shadowy quote "factory farm" on the outskirts of town. *WE* are responsible for how we treat others, please SAFE, promote Veganism! I'll mention this on my next show.